After all of the new sights and adventures we experienced in the eastern Caribbean islands, we still think the British Virgin Islands are the most beautiful. That is part of the reason we decided to do a 3 day offshore passage directly to BVI from Grenada instead of stopping off along the eastern island chain on the way. The other reason is that after BVI, we have a 7 day passage to Key West, FL – and the Boundless crew had fallen out of practice on the rigors of multi-day offshore passages since our Bermuda-Antigua trip. So it was good to refresh ourselves on things like how to get enough sleep during your three to four hour blocks off watch, preparing the ditch bags, and dodging storm cells underway. As usual, Kristin pre-cooked a few meals, each packaged for easy microwaving underway – and noted with how many carbohydrates per serving for our type 1 diabetic kids. If you look at our track north across the Caribbean, you will notice that we went a bit right of the rhumb line for the first portion of the passage until Guadeloupe and then turned more northwest. That was because we wanted to stay well east of Isla Aves, a tiny 1,200 foot long island that is a Venezuelan dependency. Due to the unrest in Venezuela, there have been reports of fishing boats and even the Venezuelan navy near the island harassing cruising yachts. And our friends Jeff & Sandy told us of a time their catamaran was chased by two suspicious boats during a trip close by Isla Aves. We stayed over 40 miles away from the island and never encountered any sketchy targets on radar. We did however have a few close encounters with cargo ships out in the middle of nowhere. Luckily commercial ships all use AIS, the automatic identification system that causes them to show up on our chartplotter with data about their name, size, direction, and speed. The most fun was what Kristin called the “Boundless sandwich” where two ships crossed in behind us within a few minutes of each other. When she first noticed them, the AIS data on our chartplotter predicted that they would both pass within 300 feet of us — not good when these ships are 1,000 feet long! Luckily both ships adjusted course slightly, but we still had all three of us within one mile. The entire passage was relatively uneventful, with nice wind and mellow seas. A beam-reach starboard tack for around 66 hours. The only trouble was that both our refrigerator and freezer stopping working with the fridge at 65 degrees and and freezer at 35 degrees. This of course only happens the week before you have four guests showing up — and have just stocked up with lots of provisions. Our fridge/freezer are keel cooled, which means that pipes run the warm refrigerant down to a heat exchange block on the outside of our hull under the waterline where the sea water cools it off. It is odd that both the fridge and freezer would go bad at the same time (they are completely separate systems). So at first we thought that the problem was because we were on a starboard tack for so long, with the keel coolers near/above the water surface. So we hoped that after we got settled in BVI in flat water that the issues might resolve themselves – but no luck. After a couple of days, I got a recommendation for a refrigeration mechanic named Alfred and had him come out to the boat. He found that the fridge was low on refrigerant, and also had some sort of blockage in the line. With a bit of added refrigerant and some “special sauce” in the pipes to breakdown wax buildup, the fridge started working again – better than it has since we left the US. The freezer did not indicate any refrigerant problem, so we just defrosted it, and then Alfred put in some extra refrigerant and secret sauce for good measure. It is now back down to the set point of 15 degrees. Victory! We made our first landfall in BVI at Virgin Gorda, grabbing a mooring ball off Spanish Town. Kristin and I are very familiar with this area since Boundless was located here at Virgin Gorda Yacht Harbour (VGYH) when we acquired her. I made three trips to Spanish Town in early 2017 as part of buying the boat and preparing it for the offshore trip back to the Chesapeake last May. I stayed many nights at Fisher’s Cove Resort next to VGYH and went to pretty much every restaurant in town. So to see the devastation to the places we knew well that resulted from hurricane Irma was quite shocking. Six months after the storm, many areas look like it just happened yesterday. Missing roofs and windows, marina yards full of mangled boats, piles of rubble everywhere. There is definitely some rebuilding work going on with building materials arriving by ferry, but it essentially looks like a war zone. We consider ourselves especially lucky since we had given thought to leaving the boat in Virgin Gorda last summer instead of sailing it back to the Chesapeake. If we had done that, Boundless would likely have been destroyed. It was mainly our interest in cruising New England that caused us to decide against leaving the boat in BVI. We are really just lucky. My go-to restaurant when I was staying in Virgin Gorda last year was CocoMaya. It is an asian-influenced small plates joint right on the beach with a classy yet relaxed vibe. And they serve Anchor Steam beer, one of my favorites, and a very welcome change from the Carib, Stag, Red Stripe, etc. Luckily for us, CocoMaya was open and looked 100% back to its pre-Irma state. We enjoyed cocktails on their beach and played a mean game of jenga before dinner. Right next to CocoMaya was the dock bar where early last year, Kristin and I decided on the boat name Boundless. As you can see from the picture below, that dock bar got washed away by Irma. In the background is Fischer’s Cove Beach Resort where the building we stayed in was destroyed. And further beyond is Virgin Gorda Yacht Harbour, where Boundless was berthed when we acquired her. When we arrive in a new country, one of the first tasks is to get connected to some sort of affordable internet solution. The first day or two we can go with the Travel Pass option from our home carrier Verizon, which gives us 500MB for $10/day. With four data-hungry crew members, that does not work long-term. In BVI, the most affordable solution seemed to be a SIM card from Flow that provides 25GB for $269 ($11/GB). While that is much more than the $2/GB on Antigua or $8/GB on Grenada, it is still cheaper than Verizon roaming. So our next stop was the capital Road Town where the only Flow store is located. We had hoped that we could anchor for a day or two in the inner harbor of Road Town where the Moorings charter base is located. Those hopes were dashed when we briefly nosed Boundless in there, saw masts of sunken boats sticking out of the diesel/sewage colored and smelling water, and quickly turned around. With no other nearby anchoring or marina options, we dropped the hook in the outside anchorage, which is good holding but quite exposed to waves. It was a lumpy night, but not as bad as some we’ve had. The next morning, we dinghied back into town and got our SIM card from Flow – and then quickly departed the rolly anchorage for the relative peace of Soper’s Hole on the west end of Tortola. I visited the West End area surrounding the Soper’s Hole anchorage last May with Frederic and Casey, the folks who helped me sail Boundless back to the US. We had our “bon voyage” dinner at the Pusser’s West End restaurant overlooking the active, beautiful waterfront stores and marinas. But now, as we pulled up to the mooring ball in Soper’s Hole, it looked like nothing had changed since the day Irma hit. The ferry terminal, the marinas, the waterfront stores, and houses on the hills – all with some combination of missing roofs, missing windows, and/or general destruction. Pusser’s West End is operating – and we had dinner there twice – but its building and dock are still severely damaged with no active renovation going on anywhere. We heard that the ownership of the buildings had changed hands just before the hurricanes. So I can only guess that the new landlords are not that wild about huge investment when they haven’t gotten any revenue yet. After the fridge got fixed in Soper’s Hole, we beat it over to Jost Van Dyke, one of our favorite islands – and home to the famous Foxy’s and Soggy Dollar bars. Compared to Soper’s, seeing the state of Jost has very encouraging. While there is still evidence of damage, clearly a lot of repair work has been done. And activity was everywhere – with the sound of building going on and cement trucks rolling off the ferry every day. We had a good chat with the manager at Foxy’s who told us about how Foxy fed everyone for free during the first month after the storm and that the island’s businesses and residents had pulled together to make progress on repairs, knowing that no one else was going to come and help them out. Really impressive independent spirit – just what you would expect of Jost! Foxy’s is in decent shape and fully operational. Although it is sad to see much of the stuff that had been stapled to the ceiling gone with the winds. We added our boat card to an open spot to start the re-accumulation. While contemplating life at Soggy Dollar, looking out at what we think is the most beautiful beach setting anywhere, we decided that we should bring Kristin’s brother’s family there next week instead of trekking to the crowded Baths on Virgin Gorda. We were able to get a slip at Nanny Cay Marina so we could easily pick up Kristin’s brother’s family (Matt, Jen, Hannah, and Amelia) for their weeklong visit. Nanny Cay sustained a lot of damage, but they have made a lot of progress. Most of the outer marina where we docked is back in place. The inner marina is still largely missing, but they have a plan to get it built out by next winter. Damaged boats are all around the yard, but with a few exceptions they are all upright and it seems under control. Lots of great deals to be had if you want a hurricane fixer-upper boat! The Fries family arrived on the ferry from St. Thomas and the 3 female cousins promptly went to the marina pool. The next day we had a nice sail over to Cooper Island and dinner at the newly re-opened resort. Like CocoMaya and Soggy Dollar, it seemed better than ever. Next it was back to Jost for more swimming off the Soggy Dollar. It was great to have Matt, a former professional sailor, skipper the boat – including tacking through the infamous Thatch Cut on the way to Norman Island. That gave me more time to focus on restocking cold beer in the fridge! And the rest of the family each took turns driving. On Norman Island, we had a nice dinner ashore at Pirate’s and then great snorkeling at the Indians and the caves. 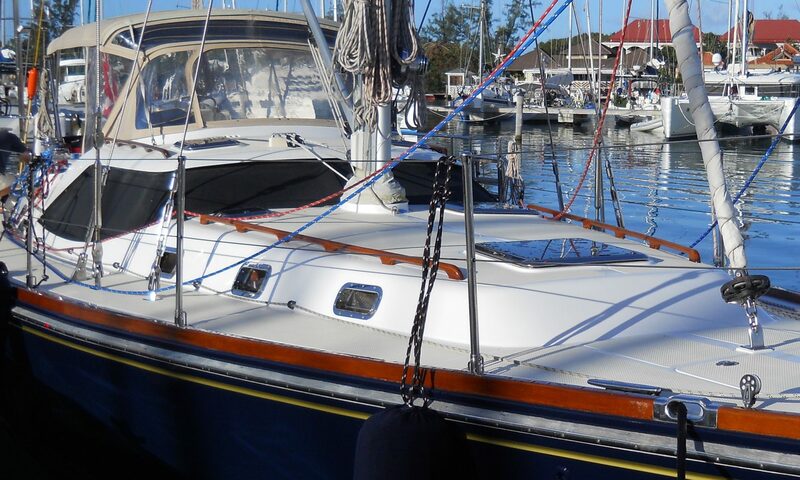 After our visitors departed from Nanny Cay Marina, we quickly refocused on getting ready for passage since we decided that the right weather window was two days from then. After a whirlwind of laundry, grocery shopping, and boat chores, we were ready to head off. Since Road Town was such a mess, we decided to check out of customs at Jost. This gave us the opportunity for one last meal at Foxy’s and to buy a few loaves of the most amazing cinnamon bread, sold from a tent since the bakery was demolished. Then we were off on our 7 day passage to Key West. It is hard to leave the Caribbean behind, but its time to start moving toward home. Have so enjoyed reading your many, many entries all year long [now]. With each reading, I tell myself that this time it’s time for a reply from me. Finally warm here after a stunningly cool March and April. I think of all all the experiences you’ve logged for yourselves [and for your readers by default] and realize with each reading how important it is to be able to view a picture [or a baker’s dozen, like this time] so that my imagination doesn’t get lost trying to picture what something must look like, mostly without success, as you lop paragraph onto paragraph of description. It’s also fun to recognize these four people that I used to come visit on occasion for math tutoring. I think… how very different your lives must have become, now that you’ve all spent this much time discovering, working together towards a common goal [like survival at sea] , bonding with nature and each other more. I’m also personally appreciative of seeing through your pictures of how the hurricanes of recent have so ruined these islands. It’s easy to forget, once the news media moves on to “more pressing” topics after only a few days or at most weeks. Wishing you all smooth sailing each day until the end of your trip. Good to hear from you. Kids will be immersed in Geometry and AP Calc in the fall – will be in touch! Love the read on the BVI! I miss that home away from home and glad to hear it is still magical to visit. Safe travels back to the mainland, Boundless! Thought of you and our time there last May. Luckily I avoided the grouchy customs woman at Road Town this time! Happy Mothers Day Kristin! And love to all! Have a great visit to Cuba! Hope Carolyn had a great mother’s day! Waiting for this rain to clear a bit before we head for Havana.